A new year, a new stash report. And it looks like I'm going to be starting this one in the red. Hopefully it's not a trend though. 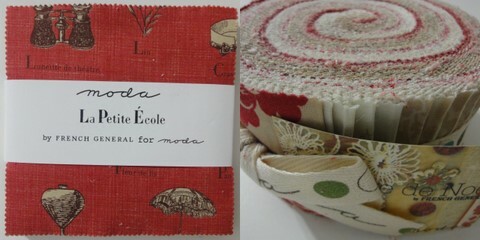 First off, the 15 yards of Moda Bella Solid Snow that I ordered from Fat Quarter Shop arrived. I laid the bolt out on the table and when Mr. Quilting Bug got home, I asked him what color he thought it was. He immediately said yellow. When I mentioned it was called 'snow', he said he couldn't imagine where there would be snow that color - unless perhaps in a highly polluted area in China. I laughed at his response. Don't get me wrong, the fabric is a beautiful soft, pale shade of yellow with a great hand. I know I can use it in any number of quilts. It just isn't the off-white that I expected from the name and picture. I'll probably end up ordering a bolt of the white in the not to distant future as well. Fortunately, although the fabric just arrived in my house, I counted it all in my final report of last year. I did purchase a couple more items from Fat Quarter Shop that do count this week: a La Petite Ecole charm pack and another Lumiere de Noel jelly roll. So now I have 4 Lumiere de Noel jelly rolls which should be (hopefully) more than enough to make a king size quilt for our bedroom. Between the charm pack and jelly roll, there's 3.5 yards of fabric. I was also fortunate enough to win a Dilly Dally layer cake from Green Fairy Quilts that adds another 2.75 yards - for a grand total of 6.25 yards. The only fabric I used is a yard of batiks that I gave my friend Kathy as part of a Thank You gift. Once I finish binding a quilt, I can count that, but it will have to go towards next weeks report. "God has created us for a life of good deeds, which he has already prepared for us to do."